Plasmids can be constructed without restriction enzymes using Gateway® cloning, which inserts DNA fragments by recombination. SnapGene simulates different variations of this method. For standard Gateway® cloning, a DNA fragment is inserted into a Donor Vector in a BP cloning reaction, creating an Entry Vector. Then the fragment is transferred to a Destination Vector in an LR cloning reaction, creating the final Expression Vector. Multisite Gateway® cloning allows up to four fragments to be inserted simultaneously. SnapGene simplifies Gateway® cloning by automating the primer design. To plan a Gateway® cloning procedure, just select the DNA fragments that you wish to join, and SnapGene will choose suitable primers. Please click below to see a screenshot and a brief tutorial video. 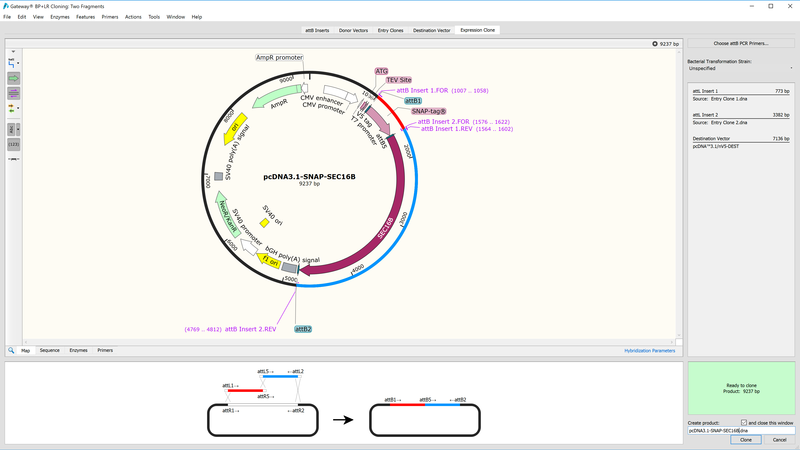 A list of annotated Gateway® cloning vectors is available online, and is embedded in the SnapGene software.